Sensitive. All skin. 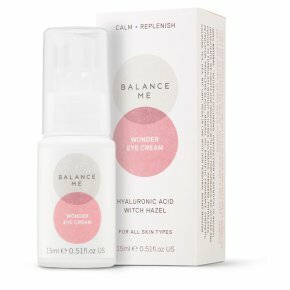 99% Natural.A hydrating, brightening and soothing eye care treatment designed to address dark shadows, firm skin and reduce puffiness. Key Ingredients: Hyaluronic Acid A super fine grade that can hold up to 1,000 times its own weight in water to help skin instantly hydrate, smooth and plump from within. Cucumber Oil Calms, soothes and brightens the eye area. Witch Hazel Tightens skin, reduces inflammation and puffiness. Free from parabens, dea, mineral oils, sulphates, pegs, petroleum, silicones, propylene glycol, microbeads, artificial fragrances and colours. Directions Tap a light layer with fingertips to moisturised skin under and around the eyes until blended.